Firmly upholding the principle of “safety comes first”, EHang not only provides you with necessary know-hows about safe flight, but also commits itself to creating drones that feature safe, free and fun-filled flight experiences for you. Please ensure your smartphone/pad, VR goggles/G-Box, and intelligent battery are fully charged. Please check your aircraft, intelligent battery, propellers and VR goggles/G-Box for any damages. Please stay informed of and abide strictly by relevant local laws and regulations. Please keep away from any non-flight zones and respect other people's privacy. Never fly under influence of alcohol or drugs. Please make sure you are in good shape mentally before every flight. 1)Always choose for every flight a wide open and safe area with good GPS signals. Never fly near airports, above crowds or in zones storing dangerous goods. Stay away from obstacles, crowds, power lines, trees or waters. Never fly within 200m of signal towers or base stations, which may cause failed take-off or lost control. 3)Please don't fly in such bad weather conditions as high temperature, snow, strong wind(≥level 5), rain or fog. Please keep your aircraft within visual line of sight and 120m flight altitude. And don't fly behind any obstacles. Throughout every flight, please keep your smartphone/pad within 3 meters from the VR goggles/G-Box and don't put them on the ground or in your pocket. Never use your hands to touch a flying aircraft under any circumstance. Don't approach and touch a landed aircraft before its propellers are completely locked. Safety always comes first in every flight. please immediately land and check the aircraft. Never hesitate to contact EHang customer service when necessary. 2)Please take a careful look at the manuals before flights for important information of product functions and operation tips, and learn how to handle accidental situations. 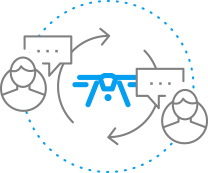 1)Accept one-to-one flight tutoring from EHang customer service staff. 2)Participate in flight experiencing activities organized by EHang and its authorized dealers, grow together with EHang. 3)Communicate with and learn from local authorized dealers. Don't worry. In GPS mode, the GHOSTDRONE will auto return and hover above the home point in case of low battery. If the battery of your smartphone, VR goggles or G-Box runs low, GHOSTDRONE will auto return and hover above the home point, until its battery is low enough to land itself. You can also charge your devices and reconnect your drone. So a charger pal always comes in handy. Disconnection may be caused by blocked communication (such as flying behind a tall building) or strong signal interferences (such as near power lines). After losing communication, the drone will auto return and reconnect with the smartphone on its way back. The App will prompt successful connection and the current "auto-return" mode. To regain avatar control, you can just press "hover" and then "cancel hover". If you exit the App in GPS mode, all you need is to reenter the App and continue the flight. The phone will vibrate if leaning over 60°, and if it leans over 90°, GHOSTDRONE will immediately trigger auto hover. The system will automatically calculate the flight data. 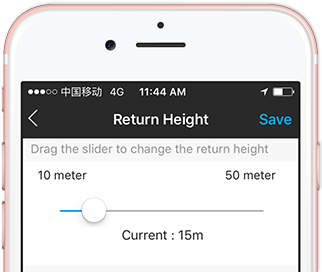 If the battery level is deemed inadequate to sustain the flight route, the App will immediately activate intelligent return. When there are good GPS signals, you can always press the hover button in case of emergency. 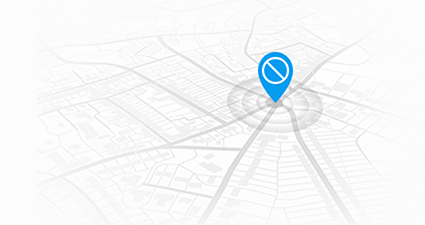 In avatar and touch-to-go GPS modes, GHOSTDRONE will auto hover when the App detects an incoming phone call. After hanging up, you can just cancel the hover and continue your flight. 1)The drone succeeds to search satellites, but drifts around after take-off due to strong magnetic interferences to the compass. 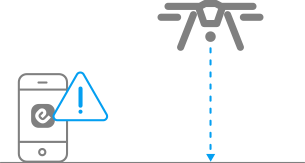 Solution: With self-safety as precondition, switch to avatar manual mode and land the drone, then move to a location far away from the interference source and recalibrate the compass. 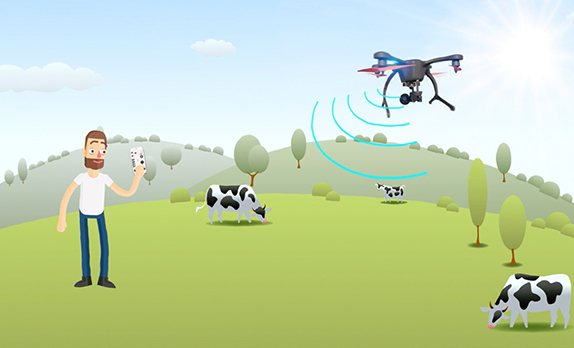 Solution: With self-safety as precondition, switch to avatar manual mode and land the drone, then change to a more open wide location with more accurate GPS positioning. Solution: Please set a "return altitude" greater than the height of surrounding buildings or obstacles in the App "settings". The default "return altitude" is 15m.